Good Morning! It's Monogrammed Monday and I am super excited to introduce you to Garland and Grace, plus they have a fabulous giveaway for you readers! Lisa McGown is the owner of Garland and Grace. Lisa spent some time developing a name for her company that reflected her hand-crafted items: garland represents something that's hung and grace represents tastefulness, beauty, and southern style. Garland and Grace features personalized hair bow holders for girls, pet leash holders and seasonal decor. Everything in the shop is beautifully hand painted. 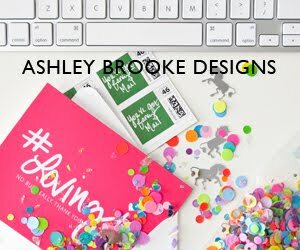 Lisa loves to customize items and collaborates with her customers to come up with their own perfect, personalized creation. Currently, Garland and Grace is filling the shop with autumn décor. And lucky for us, one reader is going to win a fabulous monogrammed pumpkin! A perfect addition to the Fall decor we are all dying to add to our homes right now! To enter, simply leave a comment and a winner will be announced next Monday! Spread the word on Twitter and get an extra entry (be sure and leave a separate comment to let me know!). Garland and grace can be found by visiting www.garlandandgrace.etsy.com or by visiting the blog, www.garlandandgrace.blogspot.com. Thanks so much to Lisa for sharing Garland and Grace with us and offering up such an adorable giveaway! Don't forget to enter! What a cute idea -- would love to win! That is just one of the cutest things I have ever seen! Thanks for hosting such a great giveaway! what a sweet fall giveaway! I love her work! Would love to win this one! Ooh pick me pick me!!! Pooh pick me pick me!!! Oh how fun! I'd love to be entered to win! The monogrammed pumpkin is too cute! I hope I win (fingers crossed)! I would like to toss my hat into the ring. 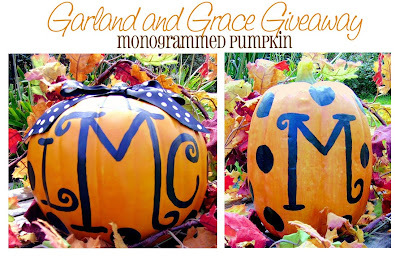 Please enter my name for a chance to win this ohhh so preppy pumpkin.